Registered in The Chinese Armorial, October 8, 2012. Arms: Azure on a bend Vert fimbriated Or between in chief and in base a laurel wreath proper Or three lions rampant Or. Crest: On a torse Azure and Gules and Or, a Livistona Rotundifolia leaf Vert charged with a Calvary Cross fleury Or. Helm: a Chinese medieval helmet affronty. Mantling: On dexter Azure doubled Or and on sinister Gules doubled Or. Motto: Fortitudo, Scientia, Veritas and Deus Familia et Patria. Assumed: Shield, motto, and helm assumed in 2012. Crest assumed on October 19, 2012. Private Registration: AssumeArms.com Coat of Arms Registry, registration number 1000200, 2012. The armiger is a Filipino citizen of Chinese descent. His great-grandfather Benito Lim (Lim Kim Phia, deceased) came from China. His immediate grandfather J. Antonio Lim, Sr. (deceased), was the former Mayor of Jimenez Misamis Occidental in the Philippines. The armiger has a Bachelor of Science Degree in Mechanical Engineering from Mapua Institute of Technology in the Philippines. He is currently working as a Ship Design Engineer in the Philippines. He is a member of the International Association of Amateur Heralds. His love of heraldry inspired him to create his own coat of arms. The symbolism of the coat of arms is greatly inspired by his being a Filipino of Chinese descent. The blue (Azure) escutcheon symbolizes peace, truth, and loyalty to God, family, and country. These ideals are also stated in the motto. The green (Vert) bend with gold (Or) fimbriation shows his loyalty and generosity to his loved ones, whom he is willing to defend at all costs. The three golden (Or) rampant lions display his courage in pursuing his goals. The two golden (Or) laurel wreaths symbolizes his goal of achieving the highest victory in his endeavours, living on the famous quote “Go for Gold”. The helm is the type used by Chinese warriors in medieval times. The helm symbolizes the Chinese part of his identity while the mantling of blue (Azure), red (Gules), and yellow (Or) symbolizes the Filipino part of his identity. The cross in front of an “Anahaw Leaf” (Livistona Rotundifolia) symbolizes his religious belief as a Filipino Roman Catholic. 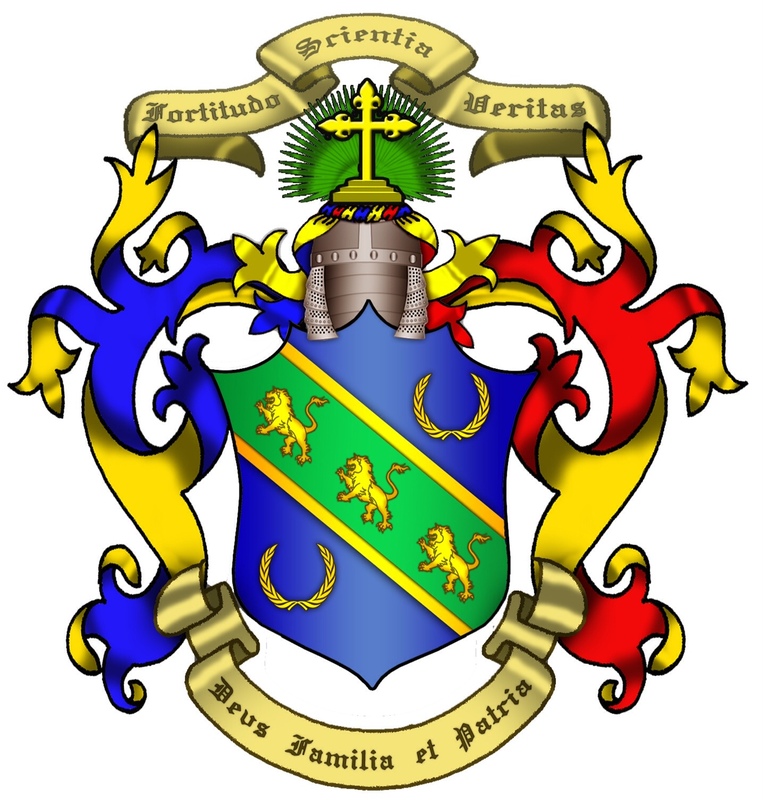 The armiger designed his coat of arms. He thanks: Edward Thiravej Ploysongsang for suggesting that the laurel wreaths be coloured as gold (Or) and that the green bend (Vert) be fimbriated in gold (Or); and Derwin James Kah Wai Mak for advice on the rule of tincture. The use of different colours of mantling on the sinister and dexter sides of the helm is an interesting way to symbolize two countries.